Accurately report supplies and services for physician, hospital outpatient, and ASC settings with the 2019HCPCS Level II Expert. Use this comprehensive reference for the HCPCS code set that focuses on management of reimbursement. This user-friendly book will guide any coder confidently through current modifiers, code changes, additions and deletions with information as dictated by the Centers for Medicare and Medicaid Services (CMS). 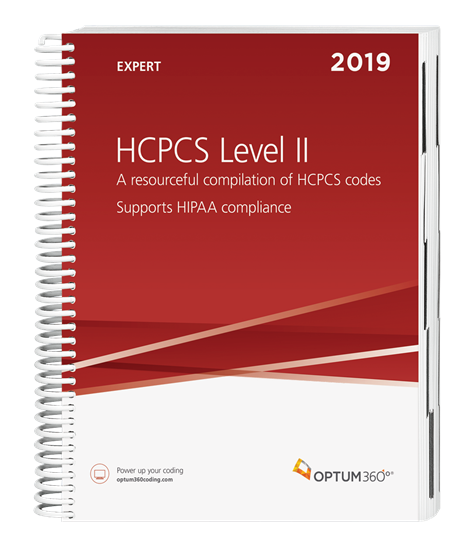 Most complete HCPCS code set available.Find information on codes from sources that generate HCPCS codes, including CMS, OPPS addendum B, and the Medicare fee schedule. Table of Drugs.Locate both generic and brand-name drugs and their corresponding codes based on the amount and route of administration. Glossary of terms.Increase your understanding of HCPCS codes to improve coding accuracy. Access to Medically Unlikely Edits (MUE).Improve accuracy of claims by ensuring compliance with the CMS program through easy access to codes and their associated MUE units. Special appendixes.Get additional information, such as the deleted codes crosswalk. Medicare Average Payment Table.Access this Medicare table online for a baseline for payment rates. APC status indicators and ASC designation symbols.Determine which codes are payable under OPPS and which codes enable billing using ASC groupings,as well as how to accurately use each to help ensure appropriate billing and reimbursement. DMEPOS icon. Distinguish codes paid under the DMEPOS fee schedule to improve efficiency when coding for supplies that should be submitted under the system to durable medical payers. In-depth illustrations.Enhance your coding process and accuracy for supplies and services with detailed visual references. difficult-to-code HCPCS Level II codes or sections. Color-coded bars and icons.Spot important information to help reduce inaccurate and denied claims with informative flags signaling Internet Only Manuals (IOM, formerly Pub. 100) references, age and gender edits, quantity alerts, new/deleted/revised code changes and government coverage and rules for each code. User-friendly appendixes.Navigate additional information easily with structured references and excerpts, including a comprehensive drug table, IOM references, acronyms/abbreviations, and modifiers. Optum360 Edge. Quarterly updates with code changes tracked throughout the year.